Huge Savings Item! 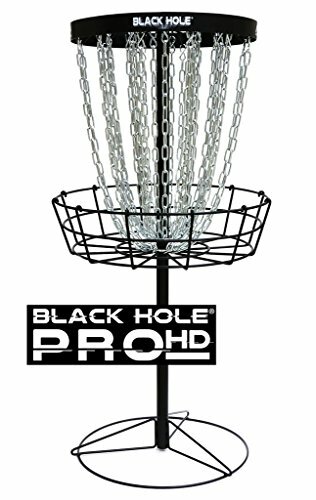 Save 11% on the MVP Disc Sports Black Hole Pro HD 30-Chain Disc Golf Basket by MVP Disc Sports at Scruffs Game. MPN: MVBSK-HD Pro Black Hole. Hurry! Limited time offer. Offer valid only while supplies last. The MVP Black Hole® Pro HD is designed to bring a heavy duty course experience to your home, practice setup, or temp course at an unbeatable price. The MVP Black Hole® Pro HD is designed to bring a heavy duty course experience to your home, practice setup, or temp course at an unbeatable price. With dimensions following the Black Hole® Pro, the Pro HD has 30 total chain strands including an inner third tier plus thicker wire construction. The symmetrically spaced chain geometry is taken from our Black Hole® Portal design, with 3 tiers comprised of 12 outer, 12 middle, and 6 inner chains. The Pro HD's chain thickness is identical to the Pro. The Pro HD's chain rack, cage, and base is constructed with thick 8mm wire compared to the Pro's 6mm wire. The added chains and heavier wire do add to the Pro HD's overall weight, but setup and breakdown is still just as easy as the Pro. For heavier duty applications, the Black Hole® Pro HD is the most robust course experience basket you can find for under $200!